Dear Subscribers, SO sorry for the extra double email post this morning. I'm sleep deprived LOL. BELLA's COAT: BasicGrey patterned paper Urban Prairie Paper: Petticoat--shaded with Prismacolour pencil crayons. The bottom of her coat (on the main image) is stitched with a row of turquoise embroidery thread. COLOURING... is all done with Copic markers since the Incandescent paper needs the permanence of them. It gives it a really unique sparkle. The first layer... is all one piece with the main embossed image, & just the bits you see coloured here. It's printed on BasicGrey Petticoat patterned paper (stuck to a piece of copy paper, it goes through the printer like a dream!) It's shaded with Prismacolour pencils, coloured with Souffle pens & stitched. Bronte the doggy. Holding on for dear life (methinks he is afraid of the dark!) He's just all one layer (embossed) and coloured with Copic markers. SKY: Frosty Downhill Glittered Paper BC-P-084 by Best creations inc. It's stitched with white & cream thread along the hilly parts. If you missed the hop this morning, then you're in for a treat. The other members of Mo's Dream Team will are sure to blow away with their AWEsome colouring & crafting talents! Thanks a million for visiting! have I mentioned you're a genius today?...well, not meaning your one JUST today...but everyday... now go take a nap! think I need a nap...typos! This is a great way to add highlights. I just followed some of you links to some of you past projects, and you've given me some great inspiration. Wow Mel this is full of wonderful ideas--chock full indeed! I love the snow drifts and those lil' snow knots are fabulous--wish I actually liked to use a needle & thread, LOL! Wonderful & beautiful winter scene--I just love it! Okay, now, those faux French knots are just too cute, cute, cute on this. Gorgeous card! 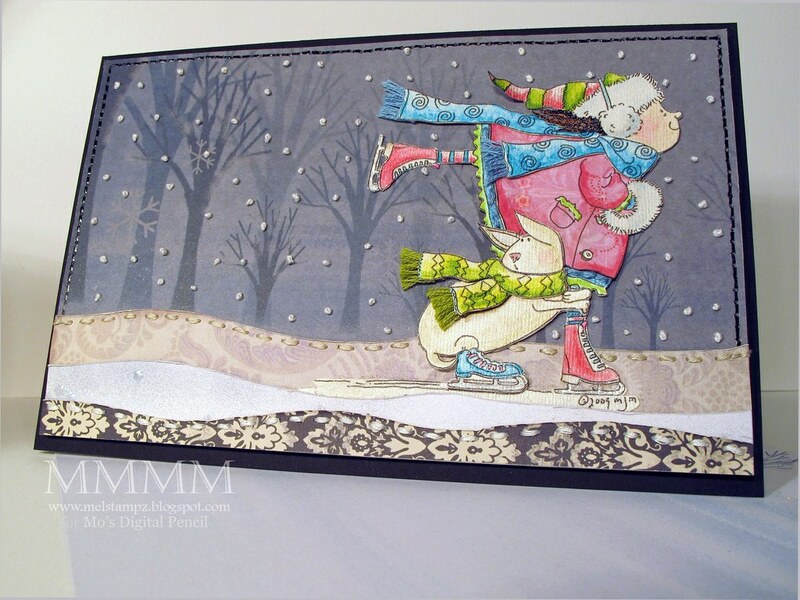 I love the background papers, they are beautiful and go so nicely with your image! How cute! I would have never thought of the french knots! I love the background paper and the french knot technique is sooo clever! Oh my - how lovely is this!! Thanks for sharing your talent with us (and the knot technique!!). Your are so creative, beautiful, thankyou, I love the way you show yours tutorials. So cute and this card rocks! Love the look of the French Knots - so cool. Great piecing too. What FUN!! I love it! Your card is amazing! Thanks for the tutorial! Mel, you amaze me.. so much detail in all your work.. i love you! :)) keep it up!! Beautiful! Love the fake snow knots! I LOVE your snowfall technique. your photography and instructions are wonderful. glad i found you through the blog hop. I love medallions, so you're layering techniques are right up my alley. The best part is people can do this w/digis! Love your snow...guess what I'll be doing now????? You just never cease to amaze me Mel... !! I want to come and stay at your house and just soak up everything I can. WOW.. you always rock!! Very cute project. What is the background.